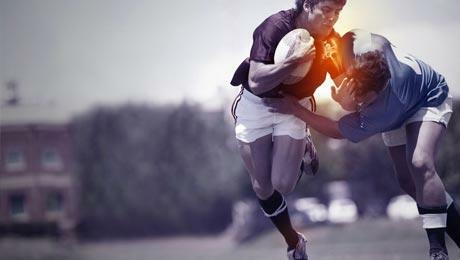 Sports injuries have a personal impact, both physical and economical. They also have a wider impact socially on health service provision. With more and more of us taking part in sport and exercise activities it is becoming more important that we do as much as we can to avoid injuring our bodies… and our wallets. From running around on a muddy pitch in Newcastle to joining the hordes cantering over Tower Bridge during the London Marathon, mass participation in sport in the UK is popular. The figures speak for themselves – according to the latest figures from Sport England* 6.1 million of us are ‘fairly active’ while a whopping 27 million (6.1 per cent) of us undertake 150 minutes or more of some kind of physical or sporting activity a week. It isn’t surprising then that there is also a corresponding increase in the number of sports related injuries in the UK. In 2016 there were 23.5 million attendances in England’s A&E departments according to Government data. Of these, 1.7 per cent were sport related. Some of the most common diagnoses were dislocations (891,000), sprain/ligament injury (711,000) and muscle/tendon injury (280,000) [Note: figures rounded up or down to the nearest 1,000]. Sports injuries clearly put A&E departments across the country under pressure. So, there is a need for people to be aware of the kinds of injury that can sustain while taking part in their chosen activity and be aware of ways that they can prevent them. The most common sports are team sports such as rugby, football (five a side and 11 a side), hockey, running, cycling, triathlon, hillwalking and mountaineering. Many of these see an upsurge in participation during key competition periods such as after an Olympiad or a major international tour for example. Common injuries that people incur include twists, sprains and strains, muscular-skeletal injuries and repetitive strain injuries. These mostly occur in the foot, groin, legs and back. The reason most people get injuries occur is because they don’t warm up and cool down correctly before and after exercise. Two other reasons for injury are incorrect form (the way you position your body and posture during a specific activity such as running), poor technique or just bad luck. Form and technique are specific to activities and best dealt with by coaches and technical manuals. Nutrition is also a factor. Fuelling your body correctly for sport and exercise is vital. Eating the right foods will help your body deal with the stress of exercise and help you to avoid injury. Again there are plenty of places to look for advice on the internet. Warming up and cooling down is easier to grasp. Here are some tips. If you are unlucky enough to sustain an injury during an activity there are some things that you can do to mitigate the impact of the injury – even before you seek medical assistance. Injuries can be worsened by not seeking the appropriate treatment or failing to take the right action immediately. By leaving the injury untreated – no matter how minor you think it is, niggles have a way of turning into something more serious – you risk longer than necessary lay-offs from the sport you enjoy or worse, time off work. Rest is a key component of the recovery process and you must rest after exercise and injury. Ice should be applied to the area around the injury to reduce inflammation and swelling. Compression also helps to reduce swelling and aid the recovery process. Elevating the injury helps to keep blood flow away from the injury and reduce swelling and pain. The RICE principal can be added to by taking ibuprofen and hydration to improve the healing process. When the injury is more serious RICE may not be enough beyond an initial first response to the injury. In this case it is wise to seek medical assistance as soon as possible after the injury. The first port of call is likely to be the local A&E unit. Sports injuries often occur at times when A&E is at its busiest. Therefore, you are likely to experience long waits, particularly as sports injuries are often seen as self-inflicted and therefore not prioritised for immediate treatment. One exception to this is the treatment of head injuries. The next port of call should be your GP. In both cases after initial examination and diagnosis you will more than likely be referred to a physio for specialist treatment. In the most serious cases you may be referred to a consultant for potential surgery. Professional sportsmen and women have the benefit of teams of medical staff to look after them. Not so the keen amateurs. The A&E and GP route is fine but the time it takes to get a diagnosis and receive suitable treatment can be protracted. Keen sports people want to get back to doing what they love as quickly as possible. And time off work needs to be avoided as much as possible too. One of the best solution is to seek consultations in quality private clinics that have the facilities to examine, diagnose and even begin treatment of the injury all in a single visit. Clinics can also offer minimally invasive surgeries in the most severe cases. Down time from sport and from work is reduced as the injury can be treated more quickly.